One could almost say that "Gin Tonic", a 36-m motoryacht built by the Scottish shipyard Hall Hassel in 1963, resembles a military vessel. The captain, Giuseppe Trasatti, welcomes me warmly. Given the hour, he invites me to share an excellent lunch. Belowdecks, the impression is completely different. Furnishings which go beyond the modern. I find them striking because of the combination of various materials (metal, wood, natural fibres, fabrics), everything seems to be without color, accentuated by the splendid collection of black and white photos. Captain how did you end up on the "Gin Tonic"? I was born in Viareggio and I began to work at sea as a cabin boy, on my father's deep-sea fishing boat. I attended the "Alfredo Cappellini" Nautical Institute in Viareggio and graduated in 1963. My first voyage was from Venice, in September of 1963, en route to Norfolk. Essentially, it was my meeting then with the great Captain Canepa to which I owe everything I learned at sea, not least the determination which enabled me to become a captain. From 1964 to 1974, I sailed for Genoa's Italian Transoceanic Company, on various marine vessels, including the "Elena", the "Silvia", the "Francesca" and the "Giovanna". After four years' sailing, I passed the long-distance captain examinations, which entitled me to command any ship, of any tonnage. What were your destinations in those years? Japan, North America, South America, Africa and Northern Europe. The ships carried bulk goods such as grain, iron ore, coal, etc. How did you happen to make the move from merchant ships to motoryachts? I married in 1974 and looked for work on yachts because such work would allow me to sail for part of the year to beautiful places around the world and then, at the end of the season, I would have more time for my family. My two sons have followed in my footsteps. Luigi, who is 28, is a long-distance captain and is currently working for the Benetti Shipyard. Luca, on the other hand, who is 27, graduated from the Technical Nautical Institute as a designer and builder. For the moment, he is sailing with me, as first officer on the "Gin Tonic". Which motoryachts did you command before "Gin Tonic"? The first motoryacht which I captained was the 30-m "Golden Horn", in 1974. In 1979, I took a position as surveyor with the Benetti Shipyard, in order to supervise the construction of a 24-m motoryacht. In 1980, I was put in charge of setting up the Profilmarine Shipyard in Turin for the total refitting of the 34-m motoryacht "Renalo", based on a design by the naval architect Mercati. Then, for a year and a half, I commanded the "Spirit of Argentina", a 31.50-m vintage Benetti, built in 1962. Finally, in December of 2001, I took command of "Gin Tonic". Why was it named after a cocktail? "Gin Tonic" is a famous drink, a tradition in the world of dining and entertaining. Who designed "Gin Tonic"? When was she last renovated? "Gin Tonic" was designed by the Hall Hassen Shipyard's design studio but, given that she is more than 40-years old, she has been renovated many times. Most recently, in 2003 in Viareggio, when she was refitted by the former SEC Shipyard. I was involved in directing the work. "Gin Tonic" has a range of months, which means that she can visit fashionable and very crowded destinations in high season. The new interior is very different from the original teak interior and has been done in an ultra-modern style. Seaweed matting on the floors, ecru fabric on the walls, and cast-iron furnishings with a rusty look for the tables and lamps, comfortable sofas and beds deliberately chosen for their casual design. And, finally, a collection of around 50 splendid black and white photos by Lobiano, who does portraits of top models in unique situations, on horseback, on racing motorcycles, out in uncontaminated nature. The season begins in Cannes, in May, for the film festival, then comes a cruise to the Balearic Islands, August is always spent at Porto Cervo in Sardinia, then Naples, the Aeolian Islands and Croatia. In September, we return to Venice for the film festival, anchoring at Punta della Salute. I read in a newspaper that you have shown great courage on several occasions. In 1996, we were on "Renalo", anchored at in the roadstead at Scilla. It was August 15th and the Feast of St. Rocco. At 2:30 in the morning, asleep in my cabin, I was awakened when someone stuck a pistol to my forehead, then I was slapped and hit by three thieves who said they had put a bomb on board. At the time, Baroness Rothschild, granddaughter of the famous banker, was one of our guests. I tried to stay calm and led the three would-be thieves into the crew area. We were able to disarm them and scare them off after a fierce fight. Main characteristics of the boat: The boat was designed by the shipyard's design studio and resembles a small ship. Interior architecture: The interior was designed by Genovese architect Misa Poggi and the style is decidedly avant-garde. 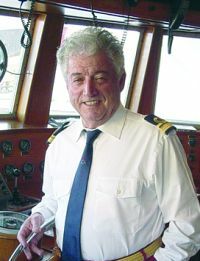 The innovations in the world of yachting which have made the greatest impression on him and why: Electronic developments; GPS compared to the computer with its electronic map; the new diesel/electric motors with Azipod propulsion, making manoeuvring much easier because it's like having a steering propeller. The worst adventure that ever happened to him as a captain: A night-time attack by three bandits. The most beautiful memory in his career as a captain: In 1976, on the "Golden Horn", I was in the English port in the Golf of Kos, with calm seas. Further out, however, the sea was rough and a Turkish caique, with the owner's brother-in-law and thirteen other people on board, including six children, began to flounder. I went out in the tender with the engineer and we managed to save the boat and bring her to shore.